This item is manufactured by Qualtex and is compatible with select models of Dyson vacuum cleaners. ..
Genuine spare part to fit select models of Dyson vacuum cleaners .. This spring is a genuine spare part to fit various models of Dyson vacuum cleaners ..
Genuine replacement cyclone assembly to fit select models of Dyson DC75 vacuum cleaners .. This is a genuine spare part to fit various models of Dyson vacuum cleaners ..
Genuine spare part to fit various models of Dyson vacuum cleaners ..
Genuine replacement part to fit select models of Dyson vacuum cleaners .. This is a genuine spare part to fit select models of Dyson DC40, DC41 and DC75 vacuum cleaners .. This is a genuine spare part that will fit various models of Dyson vacuum cleaners .. 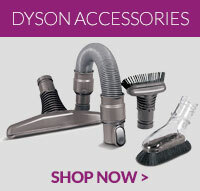 This is a genuine spare part that is compatible with select models of Dyson vacuum cleaners ..